Sulawesi is one of the most uniquely shaped islands you will find. The four peninsulas give the island an extremely long coastline. The interior of the island is quite mountainous, with not a few volcanoes scattered about. Sulawesi was called Celebes by the Portuguese, and some maps still carry that name. The island's largest city has also had a couple of different names. 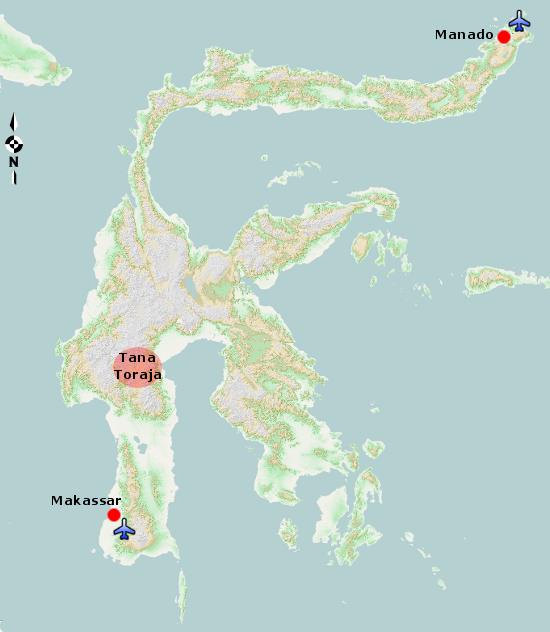 For many years at the end of the last century, Makassar went by the name Ujung Pandang. The island's most well known tourist attraction is the region of Tana Toraja, high in the mountains near the center of the island. The region features spectacular scenery that is home to a unique culture. But there's more to Sulawesi than Tana Toraja. Manado at the far northeastern tip of the island has some of the best diving on the planet.